Nintendo is expanding its array of handheld gaming devices this summer with the New Nintendo 2DS XL, a larger version of the kid-friendly 2DS, the company announced today. 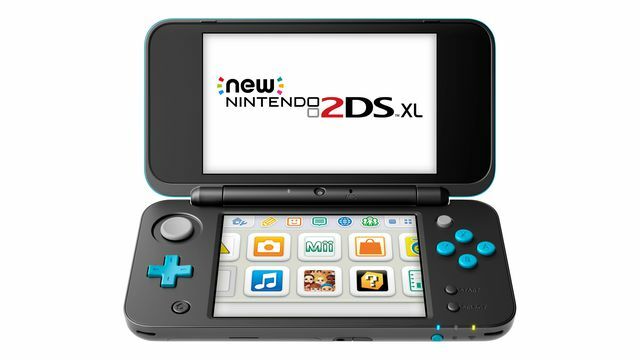 In the U.S., the New 2DS XL will be available in a black/turquoise color scheme for $149.99 starting July 28. That’s the same day as two of Nintendo’s big summer games for the 3DS family: Miitopia, a role-playing game starring Miis, and Hey! Pikmin. Nintendo announced the July 28 date today for Miitopia, and two weeks ago for Hey! Pikmin. The new handheld is also coming to Japan; in that region, it will be known as the New 2DS LL — following the existing naming scheme for the larger 3DS — and will launch July 13 for 14,980 yen. In addition to the blue/turquoise model that will be released in the U.S., the New 2DS LL will be available in Japan in a white/orange color scheme. There’s no word on whether the New 2DS XL is coming to Europe. The 2DS does not offer the stereoscopic 3D screen that is the key feature of the 3DS, and it comes in a slate form factor. But as you can see in the image above, the New 2DS XL retains the 3DS’ clamshell design. Its screens will be the same size as the ones found on the New 3DS XL: 4.88 inches for the non-3D top screen, and 4.18 inches for the resistive touchscreen on the bottom. When closed, the New 2DS XL measures 3.4 inches wide by 6.3 inches deep by 0.8 thick; the New 3DS XL has the same depth and thickness, but is 0.3 inches wider. At 9.2 ounces, the handheld’s weight is identical to that of the smaller 2DS. Because the New 2DS XL has a C-stick and ZL/ZR buttons like the New 3DS XL does, it can play the few games that are exclusive to the New 3DS XL. Like the 3DS XL models, the New 2DS XL includes an NFC reader for amiibo support and comes with a 4 GB microSDHC card for extra storage. One notable fact that the New 2DS XL has in common with the original 2DS is that it ships with an AC adapter in the box; the New 3DS XL does not. For more on the differences between the 2DS, the New 2DS XL and the New 3DS XL, check out Nintendo’s comparison site.